Under the mandate of Govt. of India, Life Sciences Sector Skill Council is working towards attaining the Skilled India vision for Life Sciences Sector which includes Pharmaceutical, Bio-pharmaceuticals and Contract Research Sector. The many new Vocational Qualifications in Life Sciences Sector have been approved by Ministry of Skill Development and Entrepreneurship which “Never Existed Before”. The Fresh entrants to Industry get the chance of earning these Qualifications via structured programs, but How about the working professionals? There are close to 9 lacs (Nine Lakhs) workforce employed with Life Sciences Sector in India who are working in various job roles in different occupations in Life Sciences Industry. All of them have skills acquired through on the job learning or by undergoing organizational/ industrial in house training programs. These working professionals can be recognized and certified for their respective skills under the “RPL Program” of Life Sciences Sector Skill Development Council. RPL is an acronym for “Recognition of Prior Learning”. The term has been aptly coined to suit its objective to recognize the skills gained through Informal and Non formal learning. Mostly, meant for those who have gained skills through experience during the job. The concept shall not only encourage existing workforce but also open path for future growth, both for individual and Organisation. It shall also help in up-skilling of existing workforce thus enhancing the quality of work in its wake. 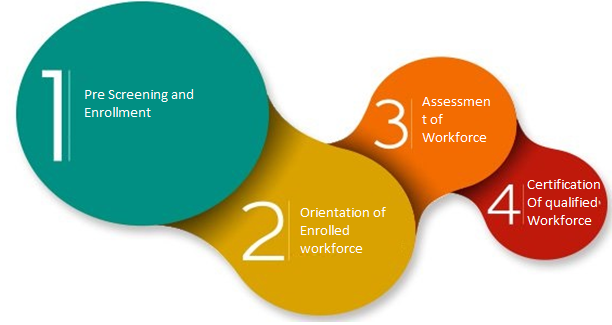 The skills are recognized through formal Assessment based on the National Occupational Standards (NOS) of the Job Role. Nationally recognized Certificate is issued once candidate qualifies the Assessments. What are the benefits of Nationally Recognized Certificate? In August 2016, CDSCO has released an advisory circular to Life Sciences Industry recommending LSSSDC RPL assessment and certification to all manufacturing units in India. And few more states following which few more states FDA's have recommend the assesments and certification. Industrial Units have come forward as first mover in compliance to the circular upto March 2018.